Your iPhone, iPad or other future iOS devices may be able to work together to create a shared virtual workspace displayed on a wall, door, or any other flat surface. 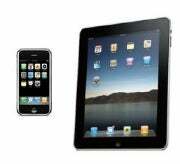 The U.S. Patent and Trademark Office on Thursday published a new patent application from Apple that suggests the company may integrate pico or mini projectors into future iOS devices such as the iPhone and iPad. But these projectors wouldn't be used just to display a presentation slideshow. Instead, they could create a virtual workspace that enables you to share files among devices and possibly even use Minority Report-style gestures to manipulate content. This patent was discovered by Patently Apple. 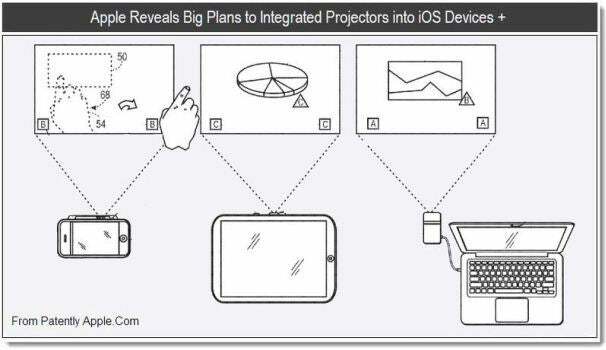 The new patent describes how you could use iOS devices or a Mac connected to an external projector to create two separate displays. Alternatively, your handsets could team up to create a larger projection. Apple calls this method a "shared workspace." In either configuration, the projection devices could share content directly via device-to-device transfer or over a shared network. It's not clear if shared workspaces are for sharing images only or any type of content. Apple's new projection system could also use cameras to detect shadows and silhouettes moving in front of the display. This would allow users to manipulate content displayed on the projection surface such as a swipe to move an image from one display to the next or a pinch to reduce the size of the image. The iOS shared workspace is an interesting idea, but many companies often patent ideas that never result in an actual product. So it's unclear if the shared workspace will ever see the light of day. But this is not the first projector-related Apple rumor to surface. In December, there were reports about the iPhone 5 getting a pico projector; then in April, 9-to-5 Mac reported on a patent for a laser projection system that could be built into Mac computers. Patently Apple in June 2009 uncovered a patent for an iPhone with a pico projector. Adding a little more intrigue to Apple's projector plans, MacRumors recently discovered that Apple acquired the domain applepico.com. It's not clear, however, if the company has plans for applepico.com or if Apple simply wanted to snap up a tech-themed domain with the company name in it.